Agate is said to be one of the oldest stones in recorded history. They have been used in jewellery since Biblical Babylonian times. They were prized gems in antiquity. 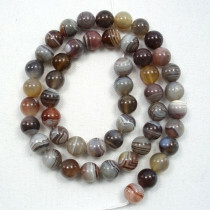 Botswana Agate is believed to be a gentle, comforting stone, enhancing creativity and abstract thinking. Sometimes called the “Change Stone” as it is beneficial in helping to handle change in a positive way. 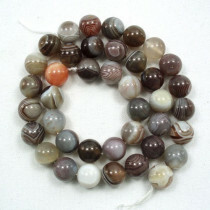 A-Grade Botswana Agate Stone Round 4 mm (~100pce Strand) - 40cm /16'" Strand. 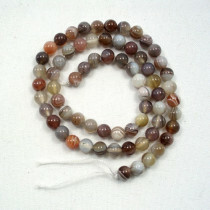 A-Grade Botswana Agate Stone Round 6mm (~66pce Strand) - 40cm /16'" Strand. 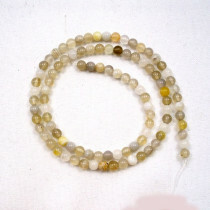 A-Grade Botswana Agate Stone Round 8mm (~50pce Strand) - 40cm /16'" Strand. 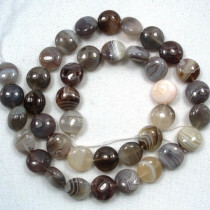 A-Grade Botswana Agate Stone Round 10mm (~40pce Strand) - 40cm /16'" Strand. 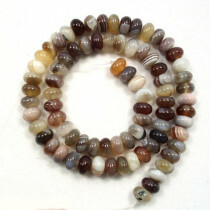 A-Grade Botswana Agate Coin 10mm (40pce Strand) - 40cm /16'" Strand. A-Grade Botswana Agate Rondelle 5x8mm (76pce Strand) - 40cm /16'" Strand. 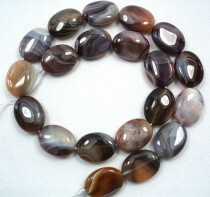 A-Grade Botswana Agate Oval 15x20mm (20pce Strand) - 40cm /16'" Strand. 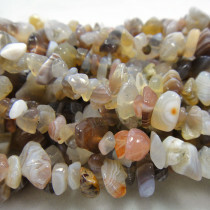 Botswana Agate Stone Chips 5x8mm (~160pce Strand) - 91cm /36'" Strand.